Look out baked ziti! Gnocchi, if you have never had it, you must! I prefer mine with a white sauce instead of red. They are also good with a tomato cream sauce. I don't know why I don't like them with plain old tomato sauce I just don't! Baked up this way they are so good! Creamy and delicious the list of ingredients go so well together. Serve with my crusty parmesan garlic bread to sop up the sauce. Cook according to package directions. Drain and set aside. Melt the butter in a medium saucepan over medium heat, then whisk in the flour until combined. Then add the heavy cream, parmesan cheese, basil, garlic powder and pepper. Turn heat to low and continue whisking, thinning with milk if needed until smooth. Once the sauce reaches your desired thickness, remove from heat and set aside. Heat a large skillet on medium heat and brown the sausage until cooked. Add the spinach, and salt and pepper to taste and continue cooking another 10 minutes. In a casserole dish coat the bottom with 1/4 cup of the sauce. 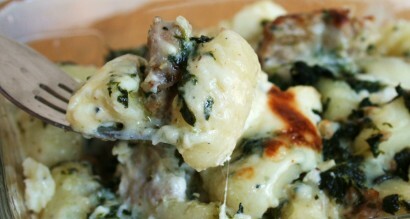 Layer the gnocchi, sausage mixture, sauce, dollops of ricotta and mozzarella. Repeat layers until all ingridents are used topping off with mozzarella. Cover and bake for 30 minutes, then uncover and bake for another 15 minutes until hot and bubbly. Wow. This reminds me of a baked goat cheese and spinach gnocchi dish I have made and love. Definitely going to have to try this. They also make whole wheat gnocchi if you were interested. Yum! Lovely dish I thee cook. Just like my Nonna used to make. Gnocchi is a proper delicacy. Rgds, A. @ Kimberly I can never find any other kind than the regular ones. I will keep my eyes out, I would like to try them. What a lovely recipe. Can't wait to try it! that looks and sounds really good! I might give it a try! thanks for sharing! This looks incredible! Thanks so much for bringing it to the Weekend Potluck. I am pinning it!